Numerous solo concerts and appearances in chamber music ensembles have taken Silke Avenhaus throughout Europe, the USA and South East Asia. She regularly appears in venues such as the Wigmore Hall in London, the Concertgebouw Amsterdam, the Salle Gaveau in Paris, the Brahms-Saal of the Wiener Musikverein, the Philharmonie in Cologne, Munich and Berlin as well as the Carnegie Recital Hall, New York. She has accepted invitations to the Marlboro Music Festival, to the Chamber Music Festivals in Prussia Cove and Moritzburg, to the Berliner Festwochen and the Rheingau Music Festival, the Salzburg Festspiele, the Lucerne Festival, the Schleswig-Holstein Music Festival, the Klavier-Festival Ruhr and the Beethovenfest in Bonn. Silke Avenhaus has worked with orchestras such as the NDR Symphony Orchestra Hamburg, the Berlin Radio Symphony Orchestra, the German Radiophilharmonie and the Munich Chamber Orchestra. In her most recent recording, Avenhaus has arranged piano works by Wagner, Liszt and Rossini within a "Salon Chromatique et Harmonique", thus putting them into a surprisingly new context. Her approach to piano and chamber music literature, characterized by joy and creativity, has led to numerous distinctions by music critics such as the Diapason d'Or, the Supraphon Award, as well as earning a nomination for the Grammy Award. Avenhaus is a much-in-demand chamber music partner as well. For EMI, ECM, Koch, Tudor, cpo, Berlin Classics, CAvi and harmona mundi she has already launched more than 30 CDs, all of them dealing with a broad range of solo and chamber music repertoire. Silke Avenhaus performs with artists such as Marie-Luise Neunecker, Christoph Poppen, Jörg Widmann, Thomas Zehetmair, Tabea Zimmermann and Sabine Meyer in the Ensemble Collage. A close musical affinity brought her together with Quirine Viersen and Antje Weithaas, with both of whom she has produced several CDs. Various living composers have written works which she premiered, to mention Magnar Aam, Helmut Eder, Detlef Glanert, Wilfried Hiller, Akikazu Nakamura and Jörg Widmann. She studied with Bianca Bodalia and Klaus Schilde (University of Music and Performing Arts Munich), György Sebök (Indiana University, Bloomington) and with Sandor Végh and Andras Schiff. 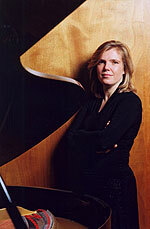 Silke Avenhaus holds an honorary professorship at the University of Music and Performing Arts in Munich and is a regular lecturer at the Villa Musica Music Academy. Bringing "classical music" to children and young people is of special importance to Silke Avenhaus, whether it be with audio books for children, via workshops or taking part in the "Rhapsody in School" project initiated by Lars Vogt.